The fabulous territory of Arabia is full of delightful attractions and sights that have amazed several visitors so far because of their staggering contrasts. However, to make Arabian trip an unforgettable experience you need to get in touch with the right kind of tourism company and Arabian Adventures is one such finding. This wonderful tour operating company has been rendering their services to tourists of Dubai for quite some time and now they are found up to the mark when it comes to maintaining standards. 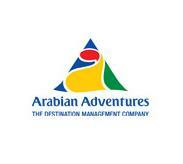 Moreover, Arabian Adventures has a wide-ranging set of services through which visitors explore this enchanting land. This could be a desert safari or overnight desert tour, sand duning, falcon show or something similar to such tours. Explore the secrets of mystical land called Dubai with Arabian Adventures, as they claim that no one knows Arabia better than them. This tourism company offers a number of services which include desert safaris, attractions & experiences plus sightseeing tours. In addition to this, they also offer corporate and trade services to their customers. Some of the highlights of their services are as: sand duning through the desert, falconry display, camel ride and enjoying an Arabian meal beneath the stars. Moreover, they also have specially made options for their clients to suit their requirements as such packages are based on date or time, type of activity, selection of transportation and various other arrangements. This means that Arabian Adventures’ guest will not need to look at the calendar or clock with nervousness, as the fun begins the moment they arrive in United Arab Emirates. The usual operational hours of Arabian Adventures area from 9:00 am and 6:30 pm. This company follow these timings on daily basis. Sheikh Zayed Road, Emirates Holidays Building, Dubai - United Arab Emirates. Arabian Adventures office is situated beyond 2.5 kilometres range of the nearest metro station therefore bus or car are best means to get to this tourism company’s office. Rostamani Tower – Dubai bus stop is 170 meters far from Arabian Adventures’ office and on foot a bus user can bridge this gap in about 2 minutes roughly. 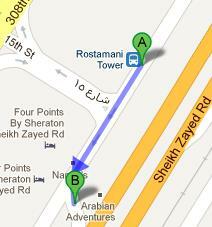 However to do so, take any of these bus numbers 21, 98E or F11 in order to arrive at Rostamani Tower – Dubai bus stop. Then from this bus stop bus user should head in the southwest direction towards 15th Street and then turn slight left in order to get to the destination that is located on the left side few meters away. See map for directions.